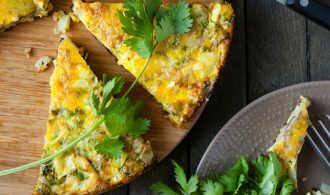 I’m becoming such a fan of make-ahead breakfast casseroles, especially this oh-so-easy Vegetable Egg Bake. Filled with favorite seasonal vegetables, high protein eggs, and a punch of savory bacon. It doesn’t matter whether it’s a holiday or just a busy weekend, these egg bakes or breakfast casseroles always seem to fit the occasion, filling my people with plenty of protein for the day. 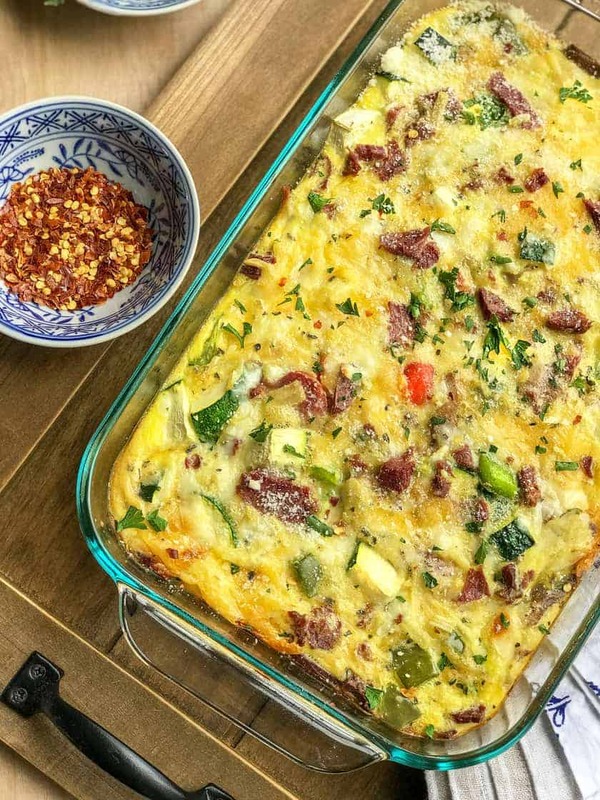 What I love about egg bake breakfast casseroles is their versatility with seasonal vegetables. As the seasons’ change, so do the veggies. With a simple ratio of eggs to milk to cheese to veggies, I switch it up often. The recipe is below, but first, here’s my egg bake rule of thumb. In a large bowl, whisk together eggs and milk; stir in garlic, salt, pepper, crushed red pepper flakes, shredded cheese and 1/4 cup Parmesan. Spray the bottom of a 13 x 9 inch baking pan with cooking spray. Add the spinach, zucchini, cherry tomatoes, bell pepper, and bacon to the baking pan; spread evenly. Pour egg mixture on top, gently stirring mixture to distribute. Cover and refrigerate about 8 hours or overnight. 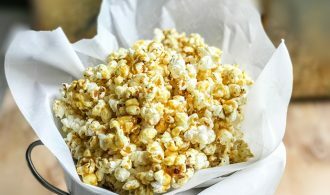 Uncover the refrigerated casserole and sprinkle remaining 1/4 cup Parmesan cheese over the top. Bake 35 to 40 minutes or until just set and a knife inserted near center comes out clean. Let stand 10 minutes before serving. Sprinkle with fresh parsley. 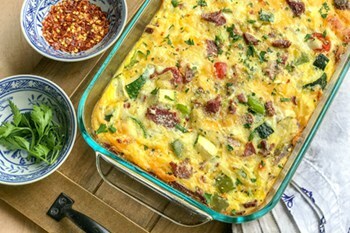 This breakfast casserole can be assembled and baked the same day. Adjust the bake time to 30 to 35 minutes and check for doneness. I like to use fresh baby spinach leaves, but if you substitute frozen spinach, be sure to thaw and squeeze out excess moisture.